Very cool concept, does it work with the swipe gestures or is it edge of screen/mouse over to pan? Hi Rhett, thanks for the response! I was thinking normal swipe to pan/change sections, maybe something like pinch to zoom. It would be cool to be able to define the entity colors ion the config page too, since when you get that many icons it’s tough to pick em all out. Just a thought, not sure how much flexibility the CSS gives you for that or if there would be supported methods to achieve that. Great thanks Joe, I think I am going to implement a colour scheme option first where you can choose the overall colours, like background, text, button colour, etc. Maybe as apart of the quick view menu resource XML I could provide a colour attribute against specific submenu items and just set it inline within the xslt. I’ll think about it, I would also need to allow an admin to easily configure that too as that is the goal, ease of use. Now this is for the web UI only? So skip my comment about Pinch/Zoom since that is going to be a OOB feature on any tablet that can support this feature anyway. Hi Rhett! I’m Demian, great job.I just tested in my Surface 2 RT and it works great! In my chorme it doesn’t work, but the experience in the tablet is really nice and smooth. Hi Demian, thanks for that feedback! that is great news, chrome support will come soon. Hey Rhett, quick question: could this be used within an entity’s forms to list the Entity Relationships and provide access to the Associated Records of that Entity? Hi Joe, not in its current state as it is tied to the sitemap for its XML data, though any data source could potentially be retrieved and converted into the menu XML used to transform with the xslt. I will look at the potential to abstract the data source away from the strict data retrieval path it has now but I cannot say it is a priority right now. Thanks for the response! That makes sense, I figured I would ask as I wasn’t sure how the associated Relationships are represented (Ribbon XML?) but that would be a very compelling use case since panning multiple times to view 12+ relationships on a given entity is a major limitation of top nav, IMO. Cheers! I am used to the new navigation now, but I don’t think it’s the best user experience. This is the first official alternative that I know of. Apparently, I am not the only one thinking about alternate navigation! 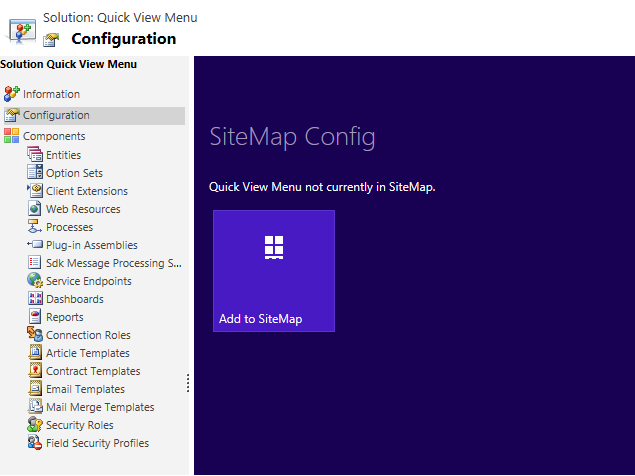 Hi Stuart, the quick view menu reads your existing sitemap and should just show the items. If you are not seeing them then there is probably an issue loading an item from your sitemap. Which version are you using and do you receive and error message or script errors in the browser? Which browser are you using? Version says 1.0.0.3. I’m trying with both chrome and IE on my CRM 2013 Online account. I don’t see any script error messages. On another note, I was sort of hoping I could pick and choose which entities I could put in the quickview since there are so many i use all the time and some I only use every few months. For those rare ones I can always use the microsoft hover bar to scroll around to. I was hoping to load the quick view screen up with just the common ones. Is that possible somehow? Any idea why I can’t see ANY entities? The latest version is 1.0.0.6, you should try this, I think it will work for you. On codeplex where you can download it, there is a Documentation Page which discusses Exclusions and how to add an Area, Group, and/or Sub Menu items to the exclusions list. Version 1.0.0.6 is showing me all the icons as expected. Thanks! Now I’m trying to create exclusions. Inside the default solution > web resources > /QV/QuickViewMenuConfig.xml I’m making changes but i cannot get any of them to work by following your sample on codeplex. As a test I tried removing orders, leads, and opps from the quick view menu. But after saving the web resource, publishing, and then reloading the page showing the Quick View all those entity icons are still there. I also remembered some entities are shown in various areas (like sales, marketing) so I tried embedding the subarea ID statements inside an area statement. That didn’t work either. Hi Stuart, the code snippet doesn’t appear for me, can you email it to me please. Also, the sitemap items like subarea should only be added to the exclusions subarea section not area, only areas should be added to the area section such as Sales, Marketing, etc. 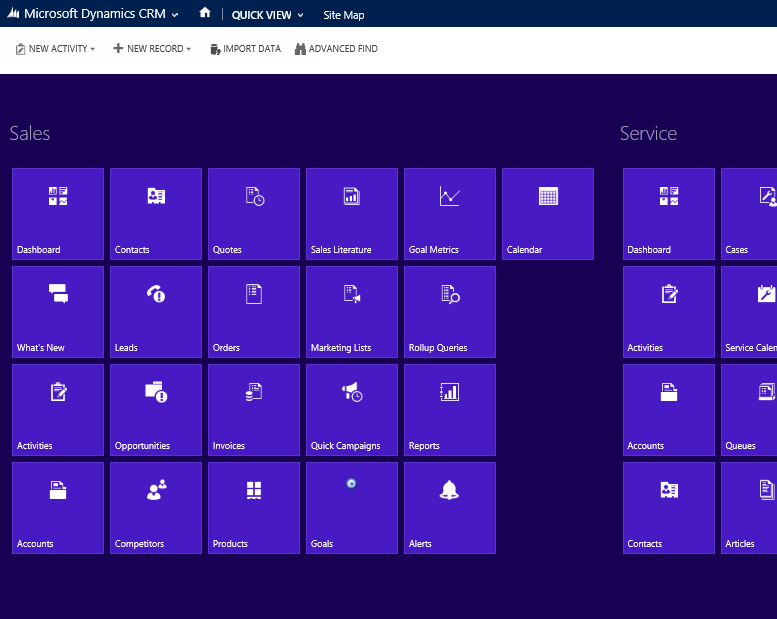 hi Rhett, have just tried on our test environment, which is running CRM 2013 SP1. it installs fine, however the following script error happens when attempting to show the quickview; This is running under IE10 on a Windows 7 environment if that is of help. I have added new Some new area in sitemap. But those changes are not reflecting in quick view sitemap. Can you please suggest how to customize those newly added area to quick view in sitemap.